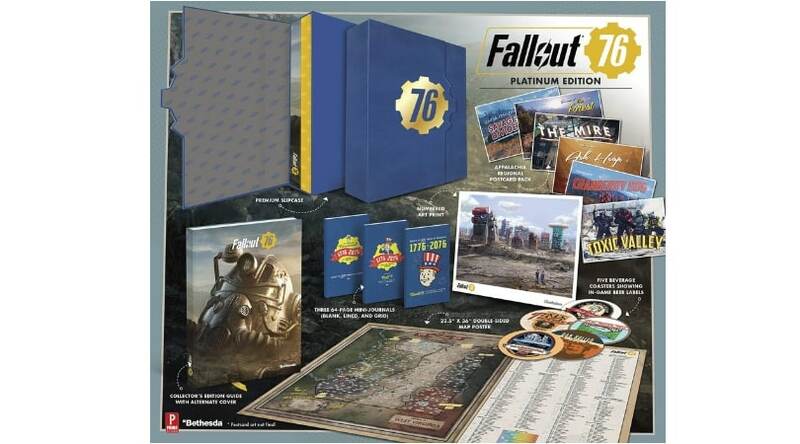 Aktuell kann man sich das Buch „Fallout 76: Official Guide“ in der Platinum Edition (Gebundenes Buch – 544 Seiten/ Englisch) für 42,77€. Collector’s Case: Safely hold your collectables in a premium slipcase with foil-accented logo and magnetic closure. Numbered Art Print: Original Fallout 76 concept art printed on 7.75″ x 9.75″ high-quality paper. Premium Double-sided Map Poster: Over 850 primary and secondary locations are labelled on this 22.5″ x 36″ poster map. Wander with purpose using this comprehensive overview of important locales and the collectables they hold! Collector’s Edition Guide with Alternate Cover and Treatments: This version of the hardcover guide, with alternate cover art and endsheets, plus a ribbon bookmark and matching endbands, can only be found inside the Platinum Edition. Inside the Guide: Detailed training, breakdowns of every quest, guides to building and crafting, tips for teaming up, and a meticulous world atlas. It’s the ultimate reference for Fallout 76! Digital Bonus: Unlock your digital version of this guide with the free code included inside. With interactive maps and a new checklist tool, it’s an essential digital companion to your adventures!